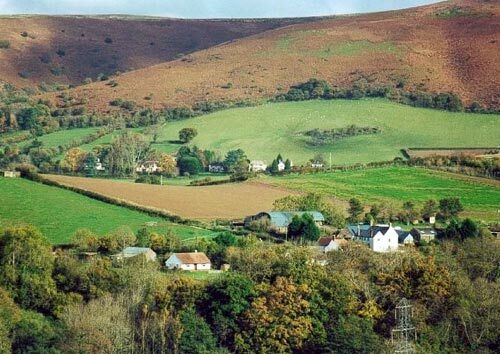 The Quantock Hills in Somerset lie to the east of Exmoor and west of Bridgwater and were the basis for England's first Area of Outstanding Natural Beauty in 1956. The area is dominated by heathland but also includes oak woodlands, ancient parklands and some agriculture. The hills run north from the Vale of Taunton Deane for about 15 miles to the north-west, ending at Kilve near the Bristol Channel. The summits of the hills some wonderful panoramas with Glastonbury Tor, the Mendips, Wales (including the Gower Peninsula), the Brendon Hills, Exmoor, the Blackdown Hills and of course the Bristol Channel. The highest summit is Wills Neck which rises to 1,261 feet (384 m) above sea level. There is much for walkers to enjoy in this compact area. The long distance path the Coleridge Way is named after the poet Samuel Taylor Coleridge who lived nearby in Nether Stowey from 1797 to 1799. In addition there are many tracks and paths across the area enabling a variety of landscapes to be included in a walk. Abundant flora and fauna add to the attractiveness of the Quantocks. In late summer the northern Quantocks are ablaze with heather and gorse and make a good time to visit. Generally the hills are covered in heathland of gorse, heather, bracken and thorn with plantations of conifer.